The village of Bethalto, Illinois was first platted in 1854, though American settlers had been living in the area since the early nineteenth century.1 Located on the Indianapolis and St. Louis Railroad, the small community boasted a booming industrial economy for the time, with coal mines, a brick yard, a saw mill, and two large flour mills.3 It should not be surprising, then, that the community began the process of incorporating as a town in 1869, just fifteen years after its initial platting.2 The final incorporation as a village under the general law was accomplished on April 23, 1873.4 A little more than a week prior to this important moment in Bethalto’s progress, but certainly part of that progress, a notice appeared in the Alton Telegraph: “Our village authorities are making arrangements to put up a two story building, the lower to be used for a calaboose [jail], clerk’s office, &c., and the upper for a hall. It is to be built of brick.”5 With that small pronouncement, Bethalto embarked upon the building of not only a community but one of the first of its two village halls. 1. arrow_upward “After First White Settler: Bethalto Community Was Once Known as ‘Rattan’s Prairie,’” Alton Evening Telegraph, 03 September 1954, section 2, page 13, column 2.; Centennial Historical and Publicity Committees, Souvenir History for the Bethalto Centennial, 1854-1954, September 3-6, 1954 (Bethalto, IL: R. L. Claussen Agency, 1954), 7-8; History of Madison County, Illinois: Illustrated, with Biographical Sketches of Many Prominent Men and Pioneers (Edwardsville, IL: W. R. Brink & Co., 1882), 419. 2. arrow_upward “Springfield: A List of Prominent Bills Signed and Bills Vetoed by the Governor–Bills Passed in Duplicate,” The Chicago Tribune, 10 April, 1869, page 1, column 4; History of Madison County, 419. 3. arrow_upward History of Madison County, 419; Centennial Historical and Publicity Committees, 5, 7-10. 4. arrow_upward History of Madison County, 419. 5. arrow_upward Billy, “Bethalto.” Alton Telegraph, 15 August, 1873, page 3, column 4. 6. arrow_upward Ann V. Swallow, “National Register of Historic Places Registration Form: Bethalto Village Hall” (PDF), National Park Service. Retrieved July 19, 2018, 3, 5. 7. arrow_upward James C. Massey and Shirley Maxwell, “Viva Italianate,” Old-House Journal 36, No. 6 (November-December 2008), 62-63, 65, 67; John Milnes Baker, American House Styles: A Concise Guide (New York: W.W. Norton, 1994), 78. 8. arrow_upward Illustrated Encyclopedia and Atlas Map of Madison County, Ill: carefully compiled from personal examinations and surveys (St. Louis, Missouri: W. R. Brink & Co., 1882), 174. 10. arrow_upward Swallow, 3, 5. 11. arrow_upward Dedication Program of the New Bethalto Municipal Building. East Alton, IL: Ace Printing Service, 1963, 11; “School System of Bethalto Started in Log Building,” Alton Evening Telegraph, 03 September 1954, section 2, page 14, column 1. 13. arrow_upward Erwin Plegge, “Notice of Special Bond Election, Village of Bethalto, Madison County, Illinois,” Alton Evening Telegraph, 06 July, 1962, page 8, column 8. 15. arrow_upward Jeffrey W. Allsman and Mayor Steve A. Bryant, Bethalto. Charleston, South Carolina: Arcadia Publishing, 2013), 22, 23, 29; Swallow, 7; Centennial Historical and Publicity Committees, 7, 9. 16. arrow_upward Centennial Historical and Publicity Committees, 11-12. 18. arrow_upward Dedication Program, 4; Centennial Historical and Publicity Committees, 35. 19. arrow_upward Dedication Program, 19. 20. arrow_upward Darryl Howeltt, “Memorial courtyard nearly complete,” The Telegraph, 16 October, 1998, page A7, column 6. 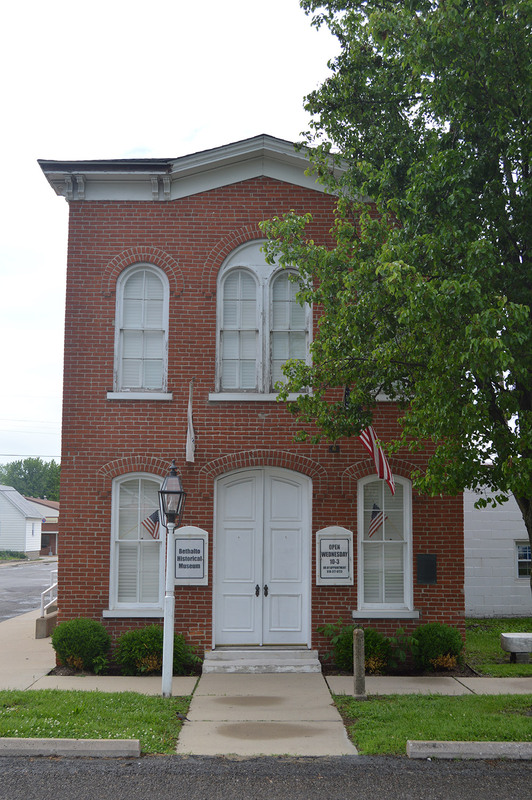 Cite this article: Phil Schneider, "Bethalto’s Original Village Hall," Madison Historical: The Online Encyclopedia and Digital Archive for Madison County, Illinois, last modified February 22, 2019, https://madison-historical.siue.edu/encyclopedia/bethaltos-original-village-hall/. We are always committed to accuracy in our articles and archive items. If you notice a mistake or have a suggestion, please contact us.